Do you need to improve your table tennis skill level? Improving your table tennis skill level. That should be the aim of every player. 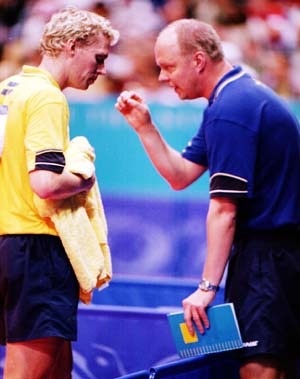 I'd highly recommend getting some good table tennis coaching as early as possible in your playing career. After all, if world class players need coaching, then you do too! Table tennis coaching will help you to improve your skills and can be great fun too. When I started playing table tennis as a junior, I was fortunate enough to be able to go to regular table tennis coaching classes. At those coaching sessions we used three table tennis tables - one table for beginners, one for intermediates and one for the top players. This in itself was a good motivator and I was able to make my way from the beginners table to the top table in a short period of time. We had one Head Coach who controlled the sessions, plus one experienced coach on each table who was able to "feed" the ball to us so that we could learn the required table tennis skill and practice our strokes. One of the things I remember most about those coaching sessions is that, before we could start playing, we had to do warm up exercises. At the time, being juniors who never worried about injuries etc, we all thought they were a waste of time - we just wanted to play! Of course, I now know different. Before you play, or take part in any table tennis coaching, you should always do warm up exercises. And it's important that you also do warm down exercises at the end of your session. Warm up exercises should last for about 10 minutes. Warm down exercises should also last for about 10 minutes. Our warm up exercises consisted of rotating wrist and neck muscles, rotating the trunk and stretching arm and leg muscles, jogging sideways, forward jogging and then running. Then we'd progress to what we really wanted to do ... play table tennis. Each session, our coaches would teach us new table tennis skills and we'd have the chance to practice new strokes. When our coaches decided that we'd mastered the necessary table tennis skill, we were given the chance to take our junior proficiency award badges. I remember that these were very important to us at that time. However, the tests we took are useful for beginners at any age. Our first table tennis skill challenge was the Bronze award. See diagram below for "Target Areas"
Using sound footwork, play 40 slow backhand push strokes back to Area B. The controller will play, slowly, from Area B, alternately to Area C and Area D.
Requirement: 40 successes before 6th error. Play 40 slow forehand topspin roll strokes back to Area A, without increasing speed. The controller will play gentle returns from Area A to Area C.
Return 40 slow balls from the controller by playing, in strict alternation, a backhand push and forehand roll, maintaining direction on 1 diagonal only. Against medium speed topspin from the controller, return the ball using backhand block strokes, from the peak-of-bounce position, maintaining direction on 1 diagonal only. From the correct position behind the baseline, serve a short forehand service so as to bounce twice in your opponent's court. Required: 4 successes to be achieved within 8 attempts. From the correct position behind the baseline, serve a short backhand service so as to bounce twice in your opponent's court. Requirement: 4 successes to be achieved within 8 attempts. From the correct position, serve a long forehand topspin service so that the ball lands within 18 inches of your opponent's baseline. Requirement: 5 successes within 8 attempts. From the correct position, serve a long backhand topspin service so that the ball lands within 18 inches of your opponent's baseline. See diagram above for "Target Areas"
Using forehand half-volley touch, return safely 10 services, varied as to topspin and chop and sidespin. Using backhand half-volley touch, return safely 10 services, varied as to topspin and chop and sidespin. Requirement: 20 successes (10 + 10), before 6th error. Return 40 balls, which have been alternately pushed and chopped by the controller to Area C, by alternately using forehand topspin drives and forehand push shots, back to Area A. Requirement: 40 correct before 6th error. Return 40 balls, which have been alternately pushed and chopped by the controller to Area D, by alternately using backhand topspin drives and forehand push shots, back to Area B. Return 40 balls, which have been alternately driven and pushed by the controller to Area C, by alternately using forehand (backspin) defensive returns and forehand pushes, back to Area A. Return 40 balls, which have been alternately driven and pushed by the controller to Area D, by alternately using backhand (backspin) defensive returns and backhand pushes, back to Area B. Answer 10 "everyday" questions on Laws and match procedure. Points allowed: For complete answer 3; for correct "sense" 2; for part answer 1. Pass score: 22 out of 30. Required: 10 good sequences before 5th error. Requirement: 10 good sequences before 5th error. Deliver 10 services of varying length, incorporating sidespin, alternately left and right. Play 50 forehand topspin drives, to one point, against half-volley returns which have been placed alternately to Areas C and D.
Good forehand position and footwork required throughout. Requirement: 50 correct before 5th error. Play 50 backhand topspin drives, to one point, against half-volley returns which have been placed alternately to Areas C and D.
Good backhand position and footwork required throughout. 2 close, 2 distant, 2 close, etc. All returns kept on the same line. Against slow backspin returns, which have been placed alternately to Area J and K, play 20 forehand and backhand topspin drives, alternately, directed diagonally to Areas F and G.
Return 20 drives, received alternately to Areas J and K, alternately using forehand and backhand backspin returns to Area L.
Play 15 double sequences of forehand backspin and backhand drive against balls which have been respectively driven to the forehand and pushed to the backhand. Play the reverse of (g), i.e. Backhand for Forehand(and vice versa). Controller returns all balls to Area H, from long distance, with backspin. Player to demonstrate loop drive 5 times against backspin returns of suitable length and strength, to suit his requirements. The aim is to show understanding of the "loop" technique and a continuity of loop drives is not demanded. If a player uses a penhold grip, for "backhand" read "to the left of the body". Players should be allowed to warm-up. 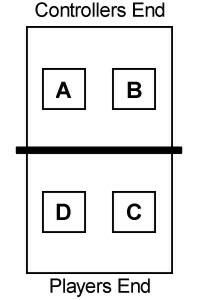 Assessors are responsible for arranging: (a) Suitable Controllers to give each player a fair chance, and (b) a Scorer, to keep count of successes and errors. The Controller should be a player able to place slow and steady balls to required targets, with the required spin. Mistakes by the Controller, or unlucky balls, or balls which are not appropriate to the required test skill, will not be counted against the player. Assessors will rule on quality of performance appropriate to each test level. A push shot is a return which is low, slow, and straight, with a trace of backspin. Appropriate Target Areas are shown in the diagram. Since the aim of Proficiency Awards is to train players to maintain control of length and direction, the Assessor should require good consistency in these respects, but allow for difficulties caused by inconsistent feeding from the Controller, or difficult playing conditions. If the exchanges become difficult it is fairer to call a let, and re-start from the score already reached. Target Areas may be regarded as a notional 18 inches square. They need not be marked out in full. 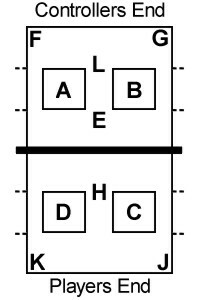 A, B, C, D are the centre points of the four courts. Two sheets of A4 paper can form a useful approximation of these Centre Areas when rehearsing the tests. 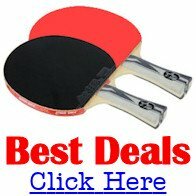 So, I recommend that you use the above skill tests to improve your table tennis skill level.